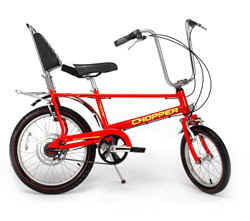 Every generation has its symbolic products and the Chopper was the essential bike of the 70s. When those red lined tyres rolled onto our streets, cycling was never going to be the same again. And for a long time there has been a void in the style bike market... until now that is. Because for a limited time only, the Chopper is back. A milestone in influence and design, the iconic Raleigh Chopper re-launches in April 2004 and retails at £199.99. The bike’s original design by Alan Oakley, the then Chief Designer at Raleigh , remains largely unchanged on the new version. Available only in the original Infra Red, the materials in the bike’s production are taken from the original Chopper concept, even using the original tyre mould from the 70s. 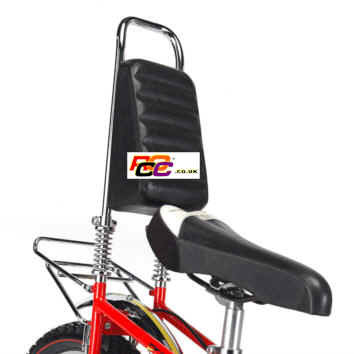 Chopper junkies will instantly recognise the legendary ‘ape-hanger’ handlebars, elongated seat, back rest, chrome seat hoop and mud guards that were instrumental to the bikes radical design. Previously positioned on the cross bar of the bike, the gearshift has been moved to the handlebars to comply with modern safety standards. Loz Cox, Chopper Product Manager at Raleigh says: "Change in the bike market and demand for retro products like the VW Beetle and Mini Cooper sparked the idea for the introduction of the new Chopper." "The new Chopper has been restyled for the new century and a new generation of kids. We have taken advantage of new materials, safety feature and production methods whilst retaining all the flair of the original look including chrome sissy bar and springs, arrow wedge frame and easy rider style handlebars. The biggest changes are the move to the lightweight alloy frame (the original was steel) and the position of the gear lever. The gears are still the Sturmey Archer 3 speed but now the shifter is on the handlebar and not on the top tube." "It’s taken us nine months to redesign the new Chopper and we know its going to prove as popular today as it did back in the 70s." A range of clothing for men and women has been designed and manufactured by *Revo to coincide with the launch of the Chopper. Items in the range include T-shirts (from £17.50), hoodies (from £45) and accessories including trucker caps, wallets, sweatbands, socks and sweatbands. 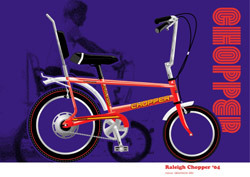 Created by Raleigh , the original Chopper (or The Hot One as it is affectionately known) was launched in America in September 1968. 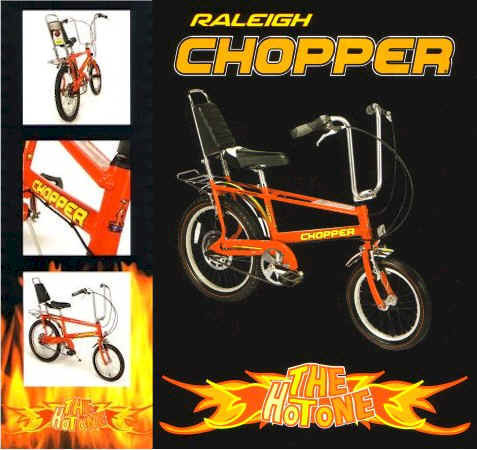 The film ‘Easy Rider’ was released here in 1969; Raleigh saw the opportunity and released the Chopper to the discerning UK audience. The Chopper frenzy exploded taking the Hot One to cult status. As important to cycling as George Best to football, no other bike has ever provoked so many memories, or had such a great influence over one generation as the Chopper, so if you didn’t get to experience it the first time round, now’s your chance. 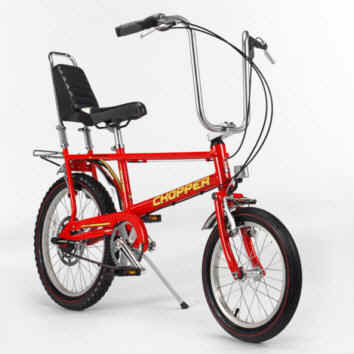 From the 1st March 2004 Chopper (priced at £199.99) is available for pre-booking at Halfords stores and Independent Bike Retailers nationwide. For further information and a full list of stockists, visit the Dealer Locator page.